Dubai: English Premier League giants Arsenal are all set for a Dubai return for another competition later this year. Ahmad Khoury, Vice-President, Board of Directors at Al Nasr, revealed that Arsenal have already promised to return for the Hamdan Bin Rashid Challenge Cup that in all likelihood is being planned during the winter break in December. Khoury, who is also a Senior Vice-President of Commercial Operations, West Asia and Indian Ocean at Emirates airline, related that the Board of Directors are currently in the process of getting confirmations from other international for the event. 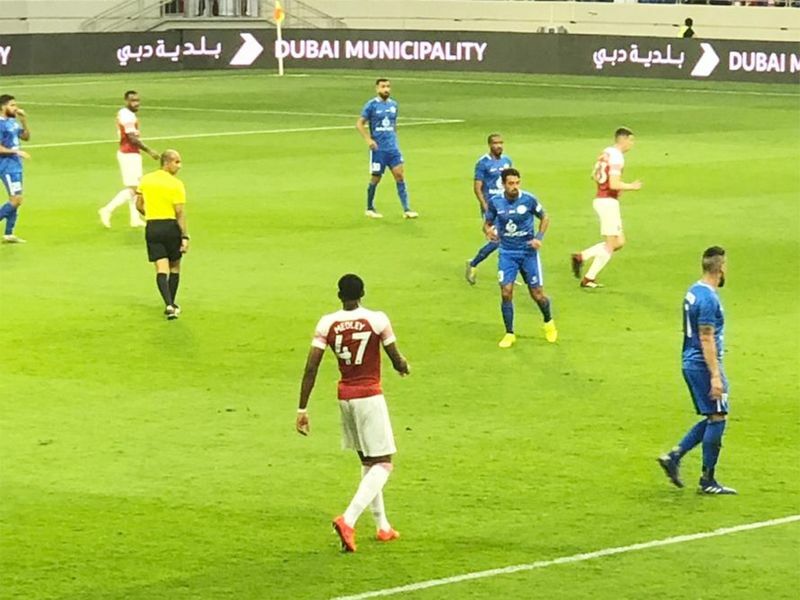 “Dubai is the sports capital of the region and our aim is to ensure we reach out to as many people across our community,” Khoury said as Arsenal played out to a 3-2 win against Al Nasr in their friendly on Tuesday. “While the friendly match between Arsenal and Al Nasr was meant to open our new Al Maktoum Stadium, we will now start working on the next big event. In the past, Dubai has organised the highly successful Dubai Challenge Cup (also known as the Dubai Football Challenge) — a friendly football tournament founded to assist the development of the UAE national team. First held in January 2007, the competition was a four-team affair with Hamburg from Germany running out as champions. In the following year, four teams contested — UAE, China, Hamburg and Brazil’s Vasco da Gama — and the Germans triumphed once again. The 2009 edition of the Dubai Challenge Cup was played as a one-off match in the first week of January 2009 between AC Milan and Hamburg and this time it was the Italian team winning 4-3 on penalties after the two were tied 1-1 at full-time. The 2011 Dubai Challenge Cup was once again a two-team affair and Milan won the trophy for the second time with a 2-1 win over Dubai’s Al Ahli. The following year, Milan completed a hat-trick of titles as Brazilian Alexandre Pato scored in the fourth minute for a 1-0 win over Paris St-Germain. The last time the Dubai Challenge Cup was played was in 2014 in front of an estimated 42,000 fans at the Emirates Sevens stadium on December 30 and Milan won 4-2 against Cristiano Ronaldo’s Real Madrid. 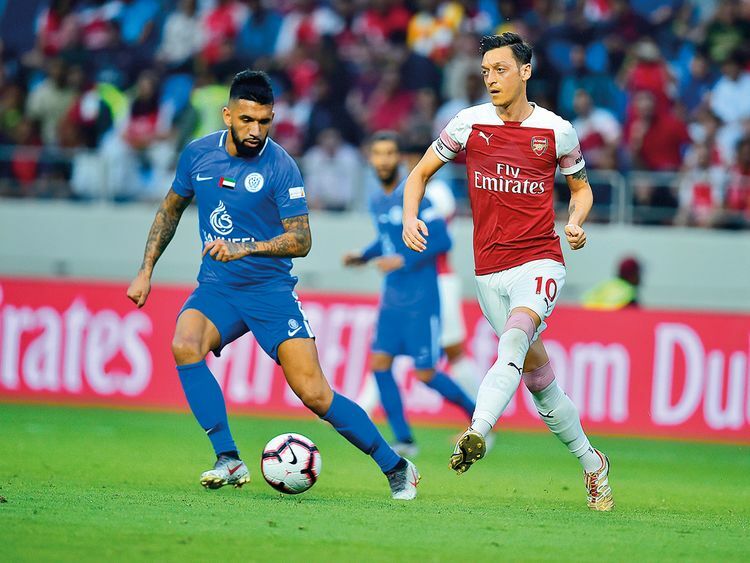 Tuesday’s friendly match turned out to be an entertaining 3-2 win for the visitors before an estimated 10,000 mostly Arsenal fans at the Al Maktoum Stadium. Ronnie Fernandez opened the scoring for Al Nasr with a deft placement from the top of the area after receiving a pass from on-loan Corinthians’ winger Junior Dutra in the 14th minute, while Carl Jenkinson slammed in his own rebound that came off the framework in the 42nd minute as the two sides went in tied 1-1 at half-time. A few changes for the second half saw the visitors take control with Mesut Ozil’s classy back heel into the path of Alexandre Lacazette fetching them a goal to put the Gunners 2-1 ahead by the 52nd minute. Tyreece John-Jules, 18, made it 3-1 in the 72nd minute when he dispossessed a defender and placed into an empty goal. Khalid Jalal pulled one back from the penalty spot in the 89th minute. This was only the second time that Al Nasr have played Arsenal. The first instance was way back in November 1976 when the English club registered a 3-1 win with Malcolm Macdonald, John Matthews and John Redford on target.